Performers include: Lorne Greene, Kent McCord, Barry Van Dyke, Robyn Douglass, James Patrick Stuart, Herb Jefferson Jr., and Fred Holliday. 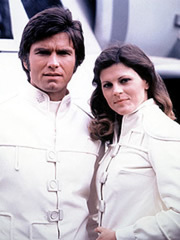 This short-lived series is a spin-off to the original Battlestar Galactica after its cancellation. Set in the year 1980, the Galactica ship and 220 civilian ships have finally discovered Earth. Unfortunately the Cylons have followed them and it’s up to the space travelers to defend Earth from the attackers. Commander Adama (Lorne Greene) still commands with the help of now-Colonel Boomer (Herb Jefferson, Jr.), Captain “Boxey” Troy (Kent McCord), and others. Many of the original Battlestar actors did not to reprise their roles for the new series.